As Catalonia declares independence we examine the history and politics behind its independence movement. It challenges several of the myths and misunderstandings about the situation. Vital reading. The battle around the October 1 independence referendum — called by the Catalan parliament but banned by Spain’s highest court — has become one of the most dramatic European developments in years. As result of attacks on polling stations that were occupied by citizens to guarantee the vote would take place, around nine hundred people were injured by police — including many elderly people and a man likely to lose an eye after being shot using a banned rubber bullet. In Catalonia the violence led to mass participation in a general strike two days later that managed to shut down most public transport, farms, docks, smaller shops, and the public sector — albeit helped in the last case by the Catalan government subsidizing lost pay. This was a political strike of the kind not seen since the struggles against the dictatorship of General Francisco Franco. That night, the king of Spain, Felipe VI, appeared on television screens across the country saying not a word about the victims nor recognizing any sense of grievance on the Catalan side. Instead, the new monarch, who since the abdication of his father in 2014 has tried to court an image of openness to dialogue, condemned the Catalan government (Generalitat) for situating itself “outside the law.” He promised the implementation of the rule of law and that Catalonia would stay in Spain. With the Catalan government expected to make a Unilateral Declaration of Independence (DUI) in the next few days it is likely that the speech was intended to prepare the ground for a new offensive and escalation. The buildup to October 1’s confrontations was shocking too. Police arrested government officials and held them overnight, seized ballot papers and referendum materials, raided printers and newspapers, took over communication centers and websites (which were reopened by hackers across Spain), and “watched over” confiscated ballot boxes. The Spanish high courts even agreed to try pro-independence movement leaders — and the Catalan police chief — for “sedition,” threatened the arrest of over seven hundred of Catalonia’s mayors, and slapped hefty fines on the members of the Generalitat-appointed referendum board to force its collapse. Yet the most serious development has been a partial coup against Catalan self-rule. Madrid is “indefinitely” withholding the general funding sent to the Catalan government for the services it administers, including health and education, and attempted to take command through a paramilitary Civil Guard commander of the Catalan “Mossos” police force, which has resisted — making it harder to put down the civil disobedience carried out during the referendum. Spain is a relatively decentralized state and despite the strong public attachment to “autonomy” in Catalonia, this may now be scrapped in the territory. A measure to take over the police and dismantle the power of the Catalan institutions is being demanded by the Ciudadanos party and is being considered as a resolution by the center-left Socialist Party (PSOE) — the second biggest party in Spain. Many people, including plenty who are uninterested in independence, see the evolving coup and attacks as intolerable. During the strike against police repression on October 3, significant numbers of people wore Spanish flags — showing their opposition to independence — covered with messages of disgust against the undemocratic clampdown. Mass picketing and actions to occupy and defend the polling stations — led by grassroots Referendum Defense Committees — have brought together moderate Catalan nationalists with radicals, including many anarchists who have tended to treat all “nationalisms” as reactionary. The escalating events bring back dramatic historical memories. In the 1970s, large occupations and demonstrations were made to regain Catalan self-rule. Previously the Catalan government had been overthrown by force: by Franco in 1939 but also in response to its declaration of statehood in 1934, and much earlier, after a bloody military siege of Barcelona (ending in 1714). Arguably, in the last few weeks Madrid has been applying a state of emergency, which also evokes an authoritarian history, even though the country is supposed now to be a consolidated “democracy” (as well as one of the largest world economies). Equally significant to the clampdown offensive has been the mass movement resisting it. On the day of the referendum, the movement repelled — in some localities with the help of firefighters — heavily equipped riot police using peaceful but assertive civil disobedience. Since the first arrests were carried out on September 20, university and sixth-form students have been on “permanent” strike, and collective pot-banging protests take place in neighborhoods every night. As identified by Barcelona Marxist Josep Maria Antentas and, on the other side of the political divide, the La Vanguardia commentator Enric Juliana, the Catalan revolt is changing quickly. The national “sovereignty” movement has held pro-independence demonstrations of around a million people every September (on Catalonia’s national day, la Diada). These were peaceful, disciplined, visually powerful, and impressively executed events — for instance, with protesters forming a human chain that spanned the 400 kilometers of official Catalan territory. However, the protests were also stage-managed, media-focused, and nationalistic events that presented little threat to the status quo. The main organizing body — the Catalan National Assembly (ANC) set up in March 2012 — adopted a plural approach almost exclusively limited to gaining statehood. It did not embrace a significant campaign seeking to introduce a constituent process within the process of independence (to bring about “a republic of the 99 percent” through a mass participatory process involving social movements such as the impressive PAH housing campaign). However spectacular the pro-independence protests, the movement ended up mobilizing little of the poorest layers of society (unlike Podemos and the new municipal coalitions). However, as repression rose in the run up to the referendum — particularly after the September 20 arrests — the movement became less contained and more dynamic. On that day, a spontaneous rebellion emerged, encompassing civil disobedience in Barcelona and satellite industrial towns that prevented the police from raiding buildings (among them the CUP headquarters). By the evening the protests took on a flavor last seen during the indignados square occupations in 2011, and the massive anti-war protests a decade earlier. The protests are clearly developing from the bottom up and becoming increasingly working class — shown most clearly in Tuesday’s strike. Juliana — an opponent of independence — said that after the protests on September 20 that the new “wave of outrage [indignación] . . . goes beyond the social limitations of pro-independence politics” and is “blurring some emotional boundaries between those pro-independence and those not,” suggesting that this trend would deepen if the crackdown continues. This would seem to be confirmed by the workplace strikes, broad mobilizations led by the Referendum Defense Committees on Sunday, which include many non-independentistas, and the pot-banging in neighborhoods that tend to vote for pro-Spanish parties. But the shift should not be exaggerated. In Carmel, a poor neighborhood in Barcelona of mainly non-Spanish and Spanish immigrant families, turnout on 1 October was only 10 percent. There are still many working people – particularly in some of Barcelona’s former industrial “red belt” — who feel Catalan independence may only strengthen the local bourgeoisie or, at best, do little to improve their lives. Yet radical activists are right in describing how the repression has led to the battle lines being increasingly redrawn around defending democracy against authoritarian rule rather than around the more controversial national divide. Further evidence of the transformation of the movement comes from outside Catalonia. The Basque country is another historic nation in the Spanish state where in the 2000s pro-independence movements, parties, and media were criminalized and repressed (aided by being seen as associated with the Basque separatist ETA’s armed struggle). In the territory, many tens of thousands have protested in solidarity with Catalans’ right to decide on two occasions. There is speculation about whether the governing right-wing Basque Nationalist Party can continue to provide parliamentary support for the minority Rajoy administration, which could even prevent the latter from governing. Since September 20, dozens of protests in support of Catalan self-determination have been held in Spanish towns and cities. On October 1, Madrid’s symbolic Puerta de Sol was full of people opposing the police violence in Barcelona. In such protests — as in Catalonia — there is a notably large presence of the generation that fought against the dictatorship. It was moving to see demonstrators in a Madrid protest singing the 1970s song “L’Estaca” — a song in Catalan about how unity can pull down a dictator. Last Saturday, large rallies were held in the city and in Barcelona in which people wore white and held white flags, calling for dialogue between the two sides. While the protest mistakenly treated the Catalan independence movement as equally responsible for the growing conflict, it still represented a form of protest against the state violence in Catalonia. None of these protests mean that most Spaniards are sympathetic towards Catalan independence. However, opposition to the repression has been growing across the whole of Spain. As this has took place, MPs in Podemos — the left-populist party arising in part from the 2011 indignados occupations — have been active and often effective in denouncing the authoritarianism of Rajoy (although they have been less critical towards that of the Spanish justice system, and have refused to recognize the binding nature of the recent referendum). After September 20. Juliana tried to warn the establishment bubble in Madrid that Catalonia may be beginning its “separation from Spain” and that a “crisis of the state” had begun. But it isn’t only the independence movement that has advanced. 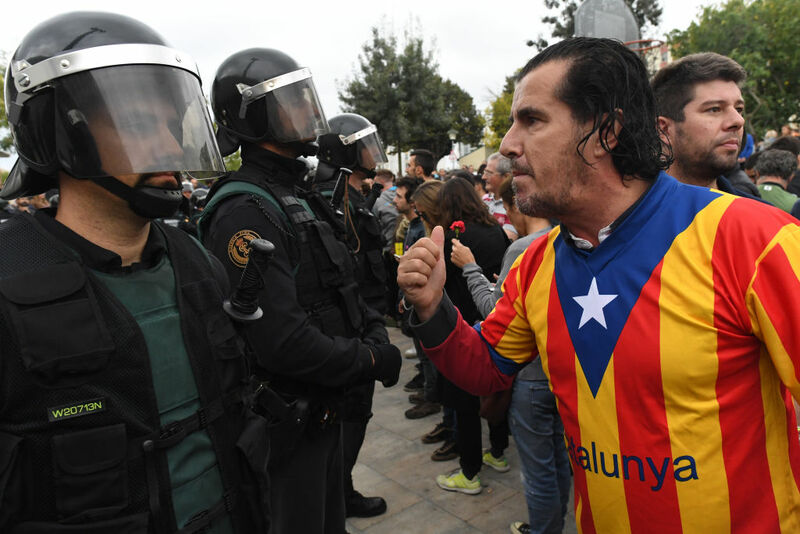 In southern Spanish towns, nationalists cheered Spanish riot police as they left for Catalonia, chanting “Go get them!” as if the police were an invading army. Thousands of police were then lodged in government-chartered cruise ships docked in Barcelona and Tarragona. One of these, incidentally, was covered with a giant cartoon of Tweety Pie surrounded by angry Warner Brother foes. Because this gained so much public attention, Tweety was then covered with a giant tarpaulin — described by one commentator as “a burka.” An ex-CUP MP quipped that the spectacle was an illustration of the shortcomings of state dependency on outsourcing. Dockers, who have recently waged a successful strike against restructuring, refused to service the ships. The heavy coercion deployed to stop the referendum means that although the votes finally cast only reached 42 percent — a percentage that should be increased slightly to take into account the likely 294,000 completed ballot papers confiscated by the police, the 90 percent support for independence on the ballot is being taken as a mandate for continuing the move to statehood. The center-left Junts pel Sí (Together For Yes) coalition and anticapitalist CUP are pushing for a unilateral declaration of independence to be issued as soon as today. Clearly, the state onslaught is pushing the movement for Catalan democracy forward, not backward. Is Catalan Nationalism Also a Problem? There are many on the Left in Spain (and to a much lesser degree, Catalonia) that are strongly opposed to the state’s authoritarianism but see Catalan nationalism as also to blame for the crisis. There are a variety of perspectives leading them to adopt this attitude, but it’s clear that many do so because they accept the caricature of the Catalan movement as bourgeois-dominated and mainly interested in putting an end to sharing its relatively high tax revenues with other Spanish regions, including in the poorer south. There are several reasons why we should reject this view. First, support for Catalan statehood is mainly left wing, which is how 72 percent of those that supported a Catalan republic before the summer self-identified (as compared to the figure of 40 percent percent for Catalans who would vote “no”). Polls also suggest that over half of those supporting independence do so mainly due to a desire to make policy changes, gain greater local governance, or because they feel “miscomprehended” — reasons that cannot be treated as reactionary. It should be pointed out that in Spain, minority languages and identities are almost absent in the media and sometimes treated as suspect. A few years ago the Constitutional Court, as well as the conservative government in the Balearic Isles (a territory where a Catalan dialectic is spoken), imposed rolling back the use of Catalan or related dialects in the school system. There is little tolerance of the Catalan language and identity in monolingual Spain. A minority — less than a third — of those wanting independence are inclined to do so to improve the Generalitat’s finances. This view is wrongly treated as dominant within “catalanisme” because it is defended by the wing of the movement that remains its most public face. As well as the liberal-right nationalists of PdeCAT — previously Convergència — holding the Catalan presidency, this wing has drawn the center-left pro-Catalan ERC (Republican Left of Catalonia), movement activists, and individuals into Junts pel Sí, an electoral alliance that won the 2015 Catalan elections. However, the Catalan Right is in fact considerably less hegemonic in pro-Catalan politics than it appears. Before the first giant pro-independence protest in September 2012, Convergència’s objective was the limited one of gaining greater fiscal powers within the existing territorial framework, and the party had been in a long-term coalition with a regionalist party — Unió — that later split in opposition to independence. It took a million people to demonstrate for full Catalan statehood for Convergència to embrace such a goal. The 2011 “revolt in the squares” may have aided this conversion. After this, in which indignados surrounding the Catalan parliament forced pro-austerity President Mas to fly into work by helicopter, Convergència and other establishment parties were deeply delegimitized. This made it difficult for Mas to turn his back on the clamor for independence when it erupted. Another sign of the largely progressive nature of the independence drive is that since “the process” began in the fall of 2012, the Left has advanced electorally. The center-left ERC has become the most popular pro-Catalan party, and, most inspiring, the CUP — a radical platform built through years of local activism — took ten regional seats in 2015. This breakthrough made the CUP the kingmaker for the Junts pel Sí alliance to form a minority government. A mass members’ meeting of the CUP in December 2015 was split down the middle about investing the pro-austerity Mas with the presidency. This led Mas to be replaced as president by Carles Puigdemont, an event that led the Financial Times’s Spanish editor to complain that a small group of anticapitalists were deciding a nation’s future. The CUP’s new bargaining power (and militant spirit) also enabled it to hold Junts pel Sí to the commitment of organizing the October 1 referendum, as well as pressuring the coalition to pass legislation banning evictions, guaranteeing a basic income, and banning migrant detention centers. Whatever the limitations of pro-Catalan politics, it is impossible to see the process simply as a slide rightward. When the Spanish Right blame “anti-system” CUP activists for the referendum taking place, it is not entirely without merit. The immediate reason for Catalonia’s “sovereignty process” is that attempts to treat the territory like a nation within the Spanish state — and grant it devolved powers comparable to those enjoyed by the Basque Country — were blocked in the 2000s. A reform of Catalonia’s Statute of Autonomy launched by the new Socialist-led tripartite government in 2003 was approved in a referendum in 2006, amended by the then also “socialist” central government, further reduced by Congress, and then, in 2010, left massively truncated by Spain’s Constitutional Court. This came after a protracted campaign against the statute by the right-wing Partido Popular (PP). Particularly irritating to many Catalans was the striking down of a reference to Catalonia being a “nation”; a main slogan in protests against the verdict was “we are a nation.” After this development, independence (as opposed to a federal state or an autonomous region) soared in popularity. Source: Barometers of the Centre d’Estudis d’Opinió (Catalan government’s polling center; Germà Bel  Anatomia d’un Desengany: 59). A more locally rooted movement developed in 2009, when activists in the coastal village of Arenys de Mar held a symbolic referendum declaring the municipality independent from the Spanish state. 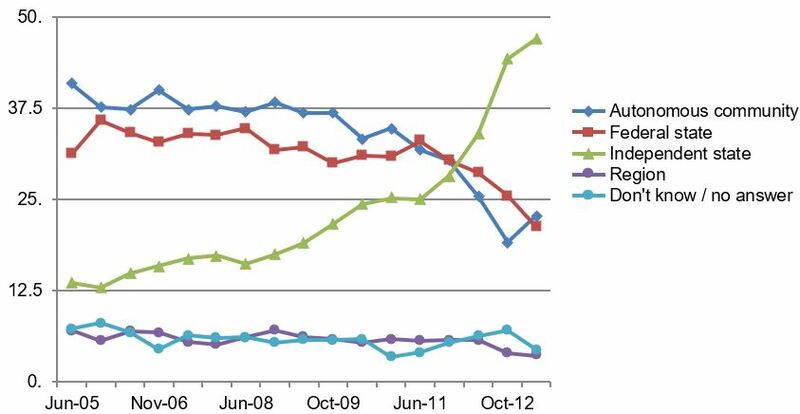 Similar polls spread across Catalonia over the following years, helping create grassroots networks of municipalities and activists that would later structure the larger movement. Parallel to these developments, pro-Catalan economic liberals developed and publicized the “economic case for independence,” according to which all Catalans would be 8 percent richer under independence. Its logic was summed up in the crude and now-discredited slogan “Spain robs us,” which was effectively defended by President Mas and helped win some new pro-independence converts among the many people suffering financially under Spain’s recession. Of course, there were enough cases of economic discrimination against Catalonia to make claims of being robbed seem reasonable. The territory has received lower investments — for example, in transport infrastructure — than other economically similar regions, and when an energy firm controlled by the Catalan savings bank La Caixa attempted to take over large Spanish energy corporations the PP and Spanish employers claimed this would lead to “excessive” economic concentration in Barcelona. While agitation for independence developed in Catalonia, things moved in the opposite direction in Spain. As the sovereign debt crisis accelerated, calls grew in political and media circles to recentralize policy making — supposedly to reduce spending on duplicated administration. PP General Secretary María de Dolores Cospedal led by example. As president of Castille-La Mancha, she reduced the number of MPs in the region’s parliament from 49 to 33, a not-so-subtle attempt to demonstrate how superfluous regional government was. When the Catalan “sovereignty process” began, calls for reducing or ending regional autonomy subsided. But polls since that time show that these ideas held sway among a significant section of Spaniards and they are now being implemented in a big way. Relatedly, some commentators have explained the Catalan crisis by referring to the limited reform of the Spanish state and right-wing politics during the transition from fascism. When the PP government weaponize the constitution against the referendum, it is the product of a negotiation dominated by Franco’s regime. The basic structures of the police forces and army remain little changed, something that at least partially explains the visible camaraderie between the far-right and police during this conflict (including a photograph of a police officer giving a fascist salute and the National Police tweeting its support for a right-wing anti-independence demonstration). After all, the forerunner to the PP was set up by Franco’s brutal Interior Minister Manuel Fraga. The party’s despotic politics were displayed in its 2015 “gag law,” which permitted giving fines of several-hundred-thousand euros to those holding unauthorized protests or sharing photos of police brutality on social media. Yet seeing current state actions as nothing but unreformed fascism has its limits. Firstly, repression against peaceful national-liberation movements is not the preserve of ex-fascist dictatorships (as witnessed when a “democratic” British state carried out the Bloody Sunday massacre). Moreover, support for prohibition of the Catalan referendum is not limited to conservatives and central state institutions. Instead, it is backed by all of the mainstream Spanish media and the largest opposition parties except Podemos. The social-democratic PSOE has been divided over the question at best. “Modernizing” leader Pedro Sánchez has been relatively quiet since the repression and backlash began. Yet the party leadership is sympathetic towards arresting Catalan ministers and its powerful right wing supports applying a constitutional article (Article 155) that would effectively end Catalan self-government. The authoritarian response by the Spanish establishment can also be understood as a continuation of comparable practices in the 2000s against the Basque national movement. Then, pro-independence parties were banned, their leaderships imprisoned, and Basque-language newspapers closed down. There was a near-consensus among the Spanish political class in favor of this, and limited opposition on the street. However, today’s context is very different. The current crackdown takes place at a time of socioeconomic decline for a great many Catalans and Spaniards, and after major leftward political shifts (as demonstrated by 2014 municipal elections in which left-wing municipal platforms took over four of the five biggest Spanish cities). This is a much less favorable scenario for serious acts of state repression to take place, even if there is some real popular support for repression. Perhaps more importantly, the movement being targeted this time is not — unlike the Basque Left — viewed as linked to armed organizations. But it is very possible that the out-of-touch Spanish establishment entered the current battle overconfident, leading it to make big mistakes and inspire a powerful response. At the same time, we should ask whether the regime consensus in favor of repression also has roots that are not specific to Iberia. Certainly no capitalist state likes to have its power weakened. Such losses inevitably hurt a state’s relative global competitiveness. Losing Catalonia would represent a particularly big blow as it provides nearly a fifth of Spanish GDP and punches above its weight in areas such as tourism, culture, and sports. Furthermore, departure by Catalonia could also encourage secession by other national minorities — particularly the economically significant Basque Country. If we add to this the feeling of psychological loss that elites (and an important section of non-elites) feel when their “imagined community” is truncated (particularly if they perceive it as a single national entity), perhaps Madrid’s response is predictable. Attachment to a nation is no less strong among many Catalan nationalists, who tend to treat Catalonia as a millenary nation. The boundaries more radical catalanistes draw include the area around Perpignan (France), the Balearic Isles, and the Valencia region, as well as what is officially known as Catalonia. These views are based on a long, but not unbroken, history. The Kingdom of Catalonia was one of the first feudal states, with a constitution preceding the Magna Carta. It also developed one of the first parliaments, which tied the monarch to ruling through agreement with the propertied classes. In the late Middle Ages, a Catalan empire dominated much of the Western Mediterranean before Castile — the key power center of Spain — emerged as a world power. “Catalunya” traded wool and slaves abroad, and its territory expanded as far as Sardinia, Naples, and Athens. The Principality of Catalonia confederated with Aragon in 1137, keeping autonomous institutions and developing its economy further through trading goods to the whole Iberian Peninsula. Historian Pierre Vilar argues that from the thirteenth century the development of a common market system, cultural community and language meant Catalonia was becoming an early nation-state. However, the following period was tumultuous: social conflict between serfs and landowners, burghers and monarchs; the collapse of population and agriculture due to plague; an increasingly over-stretched empire; wars of succession; anti-Jewish pogroms; and civil war. King Joan II survived the latter by securing the support of Castile in exchange for joining Aragon-Catalonia to this kingdom through marriage in 1469. This union, which would form the basis of Spain, allowed Catalonia to self-govern but not to control foreign policy or trade with colonies. In the sixteenth and seventieth centuries Catalonia declined economically and was increasingly administered from Madrid. The local presence of the Spanish army, which Catalans were excluded from joining but had to pay for, created resentment among the poor. In 1640, agricultural reapers led an uprising —alongside the Generalitat — that ended with the killing of the viceroy, Castile’s Catalan representative. Such a rebellion was temporarily aided by the backing of the French king until Phillip V of Castile reached an agreement with him and Catalonia lost any meaningful independence (as well as its territories that are now part of France). After Catalonia supported an alternative pretender to the throne against the Bourbon king, its capital’s citizens were subject to military siege and bloody reprisals, and by 1714 seven centuries of Catalan autonomy had ended. After a ban on trade with the rest of the Spanish empire was finally lifted at the end of the century, Catalonia prospered again, later undergoing full-scale industrialization. By the nineteenth century it was the most economically advanced part of Spain — becoming the fourth largest cotton producer in the world and developing a powerful financial sector. In the same century Catalans participated in a long history of revolts and led attempts to create a genuinely federal state. Barcelona became known as the “Rose of Fire” and Engels wrote that it was the city with “more struggle on the barricades than any other in the world.” The modern Catalan nationalist movement emerged as a force at the end of the nineteenth and beginning of the twentieth century. It emerged politically under different ideological formations — including a Republican Left whose president, Lluís Companys, declared a Catalan republic in 1934. Even when Franco banned Catalanisme and suppressed the Catalan national language and identity — including banning Catalan names and punishing children that spoke it in schools — use of Catalan continued in homes (and in FC Barcelona’s Camp Nou stadium where suppression proved too difficult due to the venue’s size). In 1979, after Catalonia had regained its institutions, a Statute of Autonomy was passed, and the Generalitat gained jurisdiction over health, education, social security, and cultural policies. Nevertheless, unlike the Basque Country, where at the time there was a larger and more violent national confrontation, the Generalitat was not allowed to collect and redistribute its own taxes — an issue that would encourage later attempts at gaining greater autonomy. Under the pro-Catalan government of the Jordi Pujol, the territory created a popular “autonomous” television network, established Catalan as the teaching language in schools, made Catalan compulsory in public information — somewhat controversially including shop names — and public sector employment. In 2000 it created the Mossos police force, which has proved its credentials as a national police partly through its ability to match or even surpass its Spanish equivalents in beating up protesters, migrants, and others. Catalonia has a long history: sometimes proud — its economic, political, and democratic precociousness — and sometimes shameful, such as with respect to the considerable wealth it derived from slave production in Cuba. The important point is that expressions of its nation-ness, autonomy, and independence have been much more pronounced and frequent than is generally known outside the region, including in the rest of Iberia. However, if we understand national consciousness as a sense of territorial “community,” which emerged in modern times as people began to have frequent interactions with states, it is questionable to present Catalonia and Catalan national consciousness as having a constant millenary history. It is unlikely that the peasantry in the early Middle Ages had much day-to-day contact with the state or developed a strong sense of Catalan identity. Additionally, after the loss of the Catalan institutions in 1714, it took a century and a half for Catalan nationalism to reemerge. It is likely that one reason for this was the economic benefits accrued from being part of the Spanish Empire —particularly by the Catalan upper classes. There were pro-Catalan popular-class movements in the nineteenth century but these did not develop strength comparable to moments when relatively wealthy sectors combined with poorer groups (as in the years prior to 1714, in the decades before the civil war, the 1970s, and now). Indeed, to best understand the Catalan question — as well as other minority “nationalisms” within the Spanish state — we need to focus on the limitations and failures of the Spanish national project. Spain went from being the world’s biggest empire after its conquest and pillage of the Americas to falling behind other states in Western Europe and North America. In the early nineteenth century, Spanish nationalism emerged in response to the Napoleonic invasion of the Peninsula. The Catalan bourgeoisie opposed the revolution and supported the restoration. Yet in the following period, disagreements emerged over protecting local industry against foreign competition. The pro-Catalan “Lliga de Catalunya” was formed to defend these interests. The party, which gained some support in the middle-classes and countryside, soon began demanding autonomy. After the Spanish-American War in 1898, when Spain lost its last big colonies Cuba, Puerto Rico, and the Philippines, Catalan regionalism grew as a force, promising modernization through building a Catalan polity that could counter-balance a backwards-looking Madrid. The Lliga’s nationalism was not left wing. Catalan industry became competitive through high levels of exploitation, and employers funded violent groups to kill radical trade unionists. The league had a similar attitude to the class struggle. It joined with conservative Carlists to form Solidaritat Catalana (SC), which won the 1907 general elections in Catalonia. Two years later it supported the army’s repression of an uprising by Barcelona workers against conscription into Spain’s new colonial war in Morocco. A hundred local people were killed in what became known as the “Tragic Week.” In the face of radical workers’ struggle, including the historic Canadiense general strike that won the eight-hour working day, Primo de Rivera took power in a military coup in 1923. He was backed by SC and the Spanish monarchy. Conservative Catalanism rightly paid a heavy price for this collaboration. In the municipal elections of 1931 the more radical Republican Left of Catalonia (ERC) displaced it as the main pro-Catalan party. A year later the Generalitat was created, while in 1934 the Second Spanish Republic was formed. The latter had many shortcomings — among them its approach to Catalan autonomy. The same year, a Generalit reform benefiting tenant farmers was struck down by the constitutional court, and when the far-right won the Spanish elections, Catalan President Companys declared a state within the Spanish Federal Republic. The army intervened, autonomy was quashed, and a state of emergency declared. (There are disturbing similarities here with recent events.) The Generalitat was reintroduced in 1936 after the Popular Front government came to power. The progressiveness of ERC’s politics had limitations that also need to be acknowledged. Most damning, these included leading party members sharing with conservative Catalan nationalism a pseudo-scientific racial view of Catalan identity (common in early-twentieth-century national movements) and helping to crush the anarchist revolution in Catalonia during the Spanish Civil War. Yet Catalan republicanism was broadly of the Left. Its separatism made it a target of the Spanish Right, which some have argued hated minority nationalism even more than communism — an attitude summed up infamously in the slogan used by a 1920s right-wing MP “mejor una España roja que una España rota” (“better a red Spain than a broken Spain”). Ending attempts at self-government was certainly a major motivation behind Franco’s military uprising. After Franco won the Civil War in 1939, Catalan institutions and public usage of the language were again banned. Many catalanistes fled into exile alongside other republicans. Companys was caught by the Nazis, handed over to Franco, tortured, and executed (a fate that PP spokesperson Pablo Casado has stunningly suggested could await the current Catalan president is he declared an independent republic). Spain officially returned to being “one.” To enforce this, members of the fascist Spanish Falange were given control of much of the state apparatus as well as the ministry of the economy. The Left and Catalanism were smashed. But a pro-Catalan spirit did not disappear completely. One of the first significant battles under Franco was a mass tram boycott in Barcelona against a hike in prices that made tickets more expensive in Barcelona than in Madrid. The protest was fueled by the poverty of the postwar period, but also by a sense of national grievance. 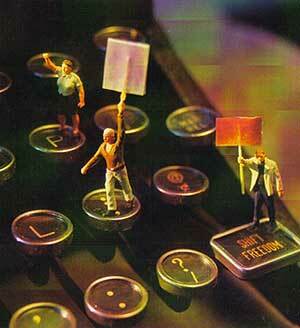 As had happened earlier in history, the movement grew stronger by combining the social and national struggle. The Catalan language survived by being spoken in the home, even if by the end of the dictatorship most Catalan speakers could not write in the language. The Catalan national movement re-emerged in the 1960s and played an important role in the movement for democracy in the 1970s (including in the Assembly of Catalonia). It allied with the working-class movements that eventually cracked open the regime, with workers raising the demand for national autonomy during strikes. After a section of the regime realized the dictatorship may not survive a mass strike wave in 1976 — and might even suffer the fate of the military regime in neighboring Portugal overthrown by a revolution two years earlier — it moved to negotiate a transition to democracy with opposition leaders. The “reformers” — including a monarch who had sworn to preserve fascism — accepted the legalization of opposition parties and unions, and organized elections held in 1977. But there was more resistance to making concessions towards national minorities. Territorial reform proved particularly difficult. This was partly because the pro-Basque ETA was continuing an armed struggle which had killed Franco’s prime minister Carrero Blanco and many members of the security forces. But it is also likely that the Right saw Catalan and Basque nationalism as a particular threat. It thus made sure that the new constitution — today being used against the referendum and movement — affirmed that “the indissoluble unity of the Spanish nation” would be guaranteed by the armed forces. The constitution was only narrowly approved by Catalans in the 1978 referendum, largely due to a desire to avoid returning to dictatorship. Today, the same text is backed by less than a third of Catalans. Autonomy was only returned to Catalonia and the Basque Country in 1981 and after the first giant protests of the democratic period. And crucially the territorial model introduced divided Spain into seventeen “autonomous communities” (ACs), allowing each a regional parliament and the chance of opting for different degrees of powers. Some of these ACs — for example, Cantabria or Madrid — were not based on any history of territorial identity. The point was to dilute and neutralize Basque, Catalan, and Galician identities. This deeply flawed process fueled Catalanism. Political hegemony in the territory transferred relatively swiftly to Jordi Pujol’s Convergència (from the Communist PSUC). Under his presidency between 1980 and 2003, Pujol led a relatively successful project of “nation-building without a state” (at the same time as enriching himself and his family through charging percentage fees for all public contracts awarded by the Generalitat). His project would not have been successful without two preconditions being in place. First, there was broad public support for normalizing and extending Catalan culture and language, which was helped by the cross-fertilization of national and working-class struggles in the previous period. Second, Catalan nationalism took a civic rather than ethnic approach. This was important because between the 1950s and 1970s over a million and a half Andalusians, Murcians, and Galicians had settled in Catalonia, attracted by a new wave of industrialization, and there were at first little or no instruments by which to socialize migrants and their children in the Catalan language and culture. Pujol, who wrote profusely on immigration and Catalonia, won his fellow liberal-conservative nationalists to a view that a Catalan is someone “who lives and works in Catalonia and wants to be [Catalan]”—a relatively open approach that over the decades enabled Catalanism to integrate within it many people from a Spanish background. Pujol himself, however, was still a supremacist: he dismissed “the Andalusian” as being an “anarchic” and “ruined man” and wanted all migrants to be assimilated in a mono-cultural Catalonia. This attitude spilled over into racism when non-Christians began arriving in large numbers in the 2000s. Pujol’s embrace of “integration” therefore can be understood as a pragmatic attempt to avoid anti-Catalan politics from reemerging among the newer population as it had at the beginning of the twentieth century. Yet it also added to the positive force of Catalanism. In all, throughout Catalonia’s modern history a general pattern can be identified: rather than Catalan national consciousness being a constant — ever-seeking to create or develop a national polity — it is a more variable reaction to the political and social limitations of the Spanish national project. Modern Catalanism has never been a working-class movement with a socialist dynamic, but it has often been a form of class struggle in which the classes excluded from political power — most often middle classes — have challenged ruling elites. The period since the dictatorship represents a partial exception, however, as Catalan employers and their political representatives have suffered little discrimination from the central state and yet have played a significant role within Catalanism. Furthermore, the post-’78 regime has been able to live with substantial degrees of autonomy — even financial in the Basque case — as long as this avoided any assertion of nationhood. While nationalists acted within the boundaries of the post-’78 territorial framework, they were tolerated. A sign of this has been that both the PSOE and PP have reached parliamentary agreements with Convergència and the Basque National Party to govern in a minority. Yet when the peripheries have attempted to gain legal recognition of their national status, the Spanish constitution is employed to sabotage and block them. This happened in the Basque case when President Ibarretxe (1999-2009) called a referendum on becoming a “community freely associated with the Spanish state.” The Zapatero government challenged this in the Constitutional Court. As with Catalan self-determination today, the “Ibarretxe Plan” was met by opposition from the whole establishment: judges, media, and the two parties that have dominated Spanish politics in recent decades. Flaws in the process of political transformation at the end of the dictatorship are a factor in this but history suggests the problem has deeper roots: that assertions of minority nationhood are accurately interpreted as questioning the success of the Spanish nation-state and are therefore seen as incompatible with it. Such an analysis would suggest that Podemos’s attempt to combine “progressive patriotism” with a defense of the “plurinational” state has limited odds of success — even in the unlikely scenario that the party could soon reach a position of power in which it could implement its ideas. The far more likely outcome to the current crisis will be that Catalonia secedes or Madrid attempts to destroy what is left of its autonomy. Some Catalanists might resent having their political project presented as driven more by events on the outside than the inside. They may even understand that treating Catalanisme as mainly reactive undermines the case for a Catalan state. Yet the question must be asked: why has the desire for Catalan and Basque nationhood only has emerged as a mass movement on the Spanish side of these historic territories? The obvious answer is that the French state has been far more successful at making people “feel” French. On the Spanish side, the mechanisms that attach people to a body politic developed late and were weak. For instance a national education system was not created until the late nineteenth century. Surveys in the 2000s suggested that identification with the Spanish nation is still relatively weak, and interestingly, was found to be weaker in the monolingual area of Extremadura than in Catalonia. Precisely what makes Catalanism a possible route to a new emancipatory politics is that it contains within it an element of political and social critique that gives its struggle for expression an emancipatory potential. It is therefore necessarily seen as an affront by the powers that be, which respond by revealing their anti-democratic and violent nature. Yet there are two souls in pro-sovereignty movement, as the CUP and others recognize, and the fight must also be for the progressive one to overcome the conservative. This requires class politics and strategy, as well as being honest about the limitations of all national projects. It means finding ways to ensure that a break with Spain is one in the interests of working people. The proposal by the Catalan Left to initiate a constituent process to create a new political and social framework through mass participation may help move in that direction. Recognizing Catalanism as a reflection of (and boost to) the failure of Spain helps explain the belligerence of the Spanish state towards Catalan self-determination. This is as key to understanding the current crisis as recognizing the limitations of the break with Spain’s far-right past or the hubris acquired by the regime due to its successful shutdown of pro-Basque parties and referendums. It suggests that reform of the state was always an unlikely outcome. In the coming days, we are likely to see more confrontations. Threats by Rajoy to suspend Catalan autonomy if independence is declared, and the likely moves to arrest government members that would follow, could provoke mobilizations that are bigger and more militant than we have seen so far. If this happens, we may be entering uncharted territory for contemporary Europe. Catalan activists in militant unions, the CUP, and radical organizations, as well as many within Podemos, los Comunes, and the pro-sovereignty movements, will try to continue to propel the democratic struggle leftward. But it will be crucial for their success that solidarity is provided internationally — including by pressing the governments that are allowing Rajoy a free hand. With thanks to Andrew Dowling, Ona Curto Graupera, and Gareth Dale This article was first published in Jacobin magazine. This is really excellent stuff. A good overview of the politics at play. It’s a decent piece which covers a lot of ground, but there are a good few factual errors. Most glaringly, the Republic II was founded in 1931, not 1934. Secondly, the Constitution of Cadiz was the most advanced constitution of its day, and was used by the liberation movements in South America as a template for future governments when fighting against Spanish imperialism in the 19th century. Thirdly, the Constitution of 1978 wasn’t “narrowly” passed in Catalonia – it was something like 90% passed. Though that is hardly surprising given that Spain was emerging from a dictatorship: any democratic constitution would have been preferable to dictatorship. It’s true that Franco hated Catalanism, but to suggest that this was the reason why he launched a coup along with the Generals, as some are saying these days, is simply a perversion of History. If Catalonia had formed part of France at the time, the generals would have launched the coup just the same. It’s a horror story like few others in European History which Paul Preston recounts in “The Spanish Holocaust”. Preston rightly calls it for what it is: a holocaust. Most of the mass graves which still exist today are in Andalusia, not in Catalonia. It was Andalusia which bore the brunt of the African Army. In any case, I’m glad to see a piece which tries to put Catalan nationalism in a wider context. Spain is the most mountainous country in Europe after Switzerland. Which explains its “localism” which all of the travelers to Spain in the 17th, 18th and 19th centuries stress as being peculiar to Spain. People have a very strong attachment to their region or “pueblo”. They are loyal to their “pueblo” much more than to the idea of Spain. It’s an important point, because the way the Catalan situation is being portrayed in the press in the UK, and especially Scotland, it’s like Catalonia is Scotland and Spain is England. But it’s just not like that. Catalonia might be like Scotland in some ways, but Spain is nothing like England. It’s a patchwork of “local” or “regional” identities divided by mountains and rivers and rough terrain. Finally, your are wrong of you think Rajoy wants to dismantle Catalan autonomy. He doesn’t. He just wants independence off the table. The proof is he just called elections there for December 21st, which Puigdemont refused to do. Thanks for the comment Redgauntlet – we are trying to provide a range of perspectives on the complex messy situation unfolding – and get wider historical context for what’s going on. Whilst all the points about horrors in Andalucia, against intellectuals and poets, against primary scholl teachers are very well made indeed, the core assertion “It’s true that Franco hated Catalanism, but to suggest that this was the reason why he launched a coup along with the Generals, as some are saying these days, is simply a perversion of History. If Catalonia had formed part of France at the time, the generals would have launched the coup just the same” is in itself a perversion. That is not to assert that Catalonia was the reason for the coup d’état, since no such single reason is ever likely to be adduced. Consider for instance that, after defeating the Republic, Franco’s national slogan was “España: UNA, grande y libre” with my emphasis added; though I have not changed the order of the words. So the very first issue which Franco wanted to hammer home was indeed the unity of Spain. A unity which at that time was only challenged by one single “region” with aspirations to restore its national status. We know what the generals wanted – I say the generals because Franco wasn’t the ring-leader to begin with; he was far too cunning for that. The generals wanted to topple the government of the Popular Front and impose a dictatorship on Spain. There can be no question that was the goal which united them. Among the rebels there were all kinds of tendencies, from the fascist Falange to the Carlists in Navarre, to monarchists in the army, and outright Nazis like Serrano-Suñer, Francos’s brother in law. Likewise, when Scottish bourgeois journalists like Iain MacWhirter say “Catalonia was oppressed under Franco”, well, so was the whole of Spain. Was there an added cultural dimension in terms of the Catalan language? Yeah, for sure. But all of Spain was brutally oppressed under Franco, and the legacy of the Civil War is still very much alive. “the anarchists … burnt down every single church in Barcelona”. Well, three cheers for them!